At the 35th Lone Star Classic Chevy Convention last month in San Marcos, members of DACC that attended the event pooled their ideas and suggestions together to select our ‘Favorite Tri Five Chevy’ at the show. This is a tradition at Lone Star as each club presents this award from their club. In the past, many of the selected favorites by DACC have been what we have felt was an outstanding ’55-’57 Chevy, but one that might not win ‘the big awards’. But this year, the members eyed a subtle but beautiful ’56 Chevy that upon closer inspection had some really neat custom touches and is a top award winner. That ’56 belongs to Al and Gwyn Burgess of Round Rock, Texas. Some of the details that caught the eyes of our members included the custom center console that is a replica of a ’56 Chevy tail light. There are ‘Bowtie’ bolts throughout the engine bay and Al machined the Bowties on the heads of the bolts and made them the exact length so when fully torqued, the Bowties aligned! He also wasn’t impressed with the cost and design of aftermarket wiper and window motors so he engineered and produced his own! The front seats were made from a late model car that Al built to have the ability to swivel for ease of entry and exit. And check out that drag link underneath as Al made a pass through hole in the oil pan for it! This ’56 is special for many reasons, and DACC selected it as ‘Our Favorite Tri Five Chevy’ of Lone Star XXXV! Below is his story and be sure to check out all the photos of this beautiful ’56 Chevy on the club website! 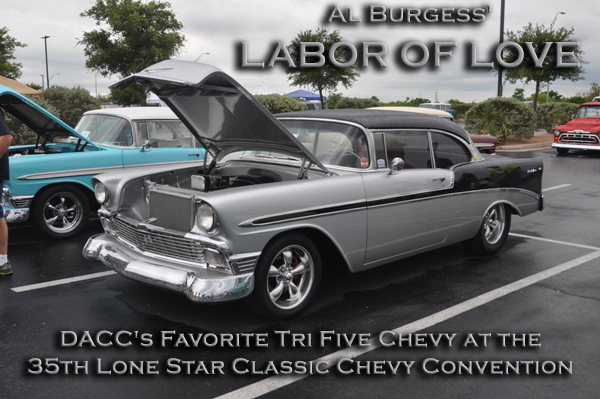 My name is Al Burgess, my wife Gwyn and I live in Round Rock, Tx, and we have been members of the Central Texas Classic Chevy Club for six years. My life long love for the 1956 Chevy began the day I traded my ’57 Oldsmobile for the Sierra gold/adobe beige 1956 Chevy 2 door sedan. I was a junior in high school with not much money but a huge desire for a cool car. It had the 265 bored out to 292 with a 3 speed on the floor and a posi-traction rear end. The interior had been redone in black naugahyde and looked classy. This car was a young kid’s dream for cruising the strip. My buddies piled in and we spent hours doing just that. Uncle Sam came calling shortly after graduation and my car went to Ft. Ord, CA with me. Unfortunately, we parted company after my return from Vietnam. It needed lots of work and I just didn’t have the resources to keep it running. The memories that car and I shared stuck with me. It wasn’t until 1995 that I was ready for a project car and it had to be a ’56 Chevy. Like so many classic cars, it was a step away from going to the salvage yard. I finally found my new project and made the purchase. It’s taken many years to restore and has been a labor of love. It was important to me to be the one to rebuild it. I had worked as a machinist for 17 years and then worked as a product development technician for 15 years at John Deere. I had lots of input and support from co-workers and friends. The car needed to be completely disassembled. The more I worked on it, the more ideas that I had to try out. My machining background allowed me to fabricate one of a kind parts and the car took on a life of its own. The plan was to have a clean engine compartment. The brakes and wipers were put underneath the dash. The firewall was smoothed out and the wiring and plumbing was all hidden. I purchased a fuel injection set up and a serpentine belt system for a clean look. I chose a big block motor to be different. The 454 engine was bored out to a 461 cubic inch displacement. The interior design was to make use of the lines of the exterior of the car. The one of a kind center console was made by a pattern maker friend. We spent a year designing it and he spent a year and a half making it. It features a dual output speaker, push button shift, and power window control switches. We made a tail light for the rear of the console. Other than the interior and exhaust system, all the restoration was done in my garage. Friends had stepped in to assist with the body work and electrical. It was painted in my garage. The car’s fit and finish came from the help of some very talented friends over the span of 10 years. There’s a special enjoyment in attending car shows that is very gratifying for me. I never tire sharing information and ideas about my car with other builders. I’m still interested and open to new innovations other builders are coming up with. There will always be changes to make!